We are making steady progress with the first phase of our extension plans. After approval of plans our first task was to realign the road to the bottom car park. This enabled us to relocate our boundary wall and access ramp so we could fit in the railway line to the proposed tunnel. 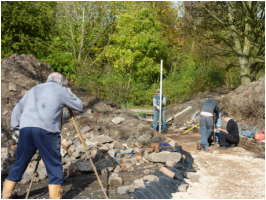 The next tasks were to relocate our boundary wall, gate and fence, form the track bed for the new line to the proposed tunnel, and extend the access ramp. The ramp has to be able to take heavy goods vehicles which may have to cross the track to access the car park. Work ceased during our main Summer running season. With Summer over, work could start on the tunnel. Our thanks go to McAuliffe Group who provided the men and machines to dig the cutting. The tunnel sides, roof and portals are to follow. Video clip of the digging. Work continues on preparing for the concrete slab at the base of the tunnel and also marking out and surfacing ready for the exit track.